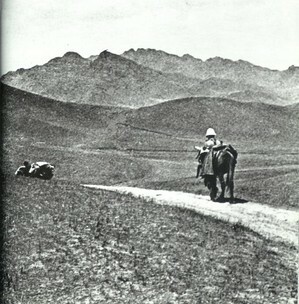 Teilhard de Chardin on the Mongolian plateau in 1924. It was around this time he wrote “The Mass on the World”. Teilhard de Chardin set sail for his first trip to China in Spring 1923. He landed at Shanghai and proceeded to travel by train to Tientsin, a coastal city some eighty miles from Peking where Emile Licent, S.J., had built his museum and housed the fossils he had collected in China since his arrival in 1914. The two French Jesuits were both outstanding scientists and developed a solid working relationship. However, Teilhard and Licent never became close friends due to differences in social, spiritual and intellectual temperments. Licent, a northerner, knew the Chinese country and language very well and was a skilled negotiator with the locals. Licent was very independent in his work. He was primarily interested in collecting fossils rather than interpreting their significance. Moreover, he was a spiritual stranger to mystical intuitions. Teilhard, on the other hand, was more outgoing; he enjoyed conversational society in which he could relate his geological knowledge to a wider scientific and theological sphere. Teilhard was a deep mystic who felt compelled to translate his experiences in an intellectual manner. “Since once again, Lord — though this time not in the forests of the Aisne but in the steppes of Asia — I have neither bread, nor wine, nor altar, I will raise myself beyond these symbols, up to the pure majesty of the real itself; I, your priest, will make the whole earth my altar and on it will offer you all the labors and sufferings of the world. Over there, on the horizon, the sun has just touched with light the outermost fringe of the eastern sky. Once again, beneath this moving sheet of fire, the living surface of the earth wakes and trembles, and once again begins its fearful travail. I will place on my paten, O God, the harvest to be won by this renewal of labour. Into my chalice I shall pour all the sap which is to be pressed out this day from the earth’s fruits. One by one, Lord, I see and I love all those whom you have given me to sustain and charm my life. One by one also I number all those who make up that other beloved family which has gradually surrounded me, its unity fashioned out of the most disparate elements, with affinities of the heart, of scientific research and of thought. And again one by one — more vaguely it is true, yet all-inclusively — I call before me the whole vast anonymous army of living humanity; those who surround me and support me though I do not know them; those who come, and those who go; above all, those who in office, laboratory and factory, through their vision of truth or despite their error, truly believe in the progress of earthly reality and who today will take up again their impassioned pursuit of the light. These sentiments would eventually become incorporated as part of mainstream Catholic theology through the writings of Pope Benedict XVI and other leading theologians. In April 1924, Teilhard de Chardin and Licent set out for their second expedition to Gobi, north of the Ordos. This expedition was not as successful with either new essays or new fossils as was the earlier one. In September 1924, Teilhard was able to visit his sister’s grave in Shanghai and from there return to Paris. Little did he know that he would run into his first major confrontation with the Church hierarchy over Teilhard’s ideas on original sin. This entry was posted in Uncategorized and tagged China, Christ, Emile Licent, Eucharist, Mass on the World, Mon Universe, Ordo Desert, teilhard de chardin. Bookmark the permalink. Many, many thanks for “Mon Univers.” Very precious for me. This entire post speaks deeply to me. The “Mass on the World” comes to mind every time I’m at Mass and “Mon Univers” is a beautiful addition to these thoughts. Teilhard expresses truths in such beautiful language – “The Host is like a blazing hearth from which flames spread their radiance” is just one example. Thank you. Hi Lynda and Claire. Thank you for stopping by. These two poems are precious to me also. I remember reading it a few years ago for the first time as I was watching a sunset and it was the first true mystical experience I had. That experience has added entirely new dimensions to image of God, the Mass and my entire Christian life.